Why art thou so far from helping me and from the words of my roaring? 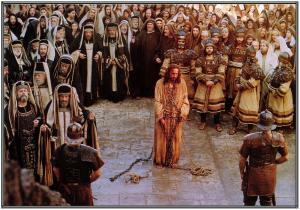 Did You Know That Jesus Was Despised? Isaiah 53:1-3, Who hath believed our report? and to whom is the arm of the LORD revealed? What does it mean to be despised? When you are despised, you are treated with scorn, contempt and disdain: You are abhorred and treated as worthless, without value. Contempt is bitter scorn, willful disobedience or open disrespect. Reject is to refuse to accept or use, to throw away, discard, get rid of or to disregard. Matthew 26:66-68, What think ye? They answered and said, He is guilty of death. Then did they spit in his face, and buffeted him; and others smote him with the palms of their hands, Saying, Prophesy unto us, thou Christ, Who is he that smote thee? Jesus was a man of sorrow. Isaiah 53:3, He is despised and rejected of men; a man of sorrows, and acquainted with grief: and we hid as it were our faces from him; he was despised, and we esteemed him not. What does it mean to be acquainted with something? When you are acquainted with something you are familiar with it. If it is a person you are familiar with that person. You know them, you have information about them because you have spent time with them. All they that see me laugh me to scorn: they shoot out the lip, they shake the head, saying, He trusted on the LORD that he would deliver him: let him deliver him, seeing he delighted in him. But thou art he that took me out of the womb: thou didst make me hope when I was upon my mother's breasts. I was cast upon thee from the womb: thou art my God from my mother's belly. Be not far from me; for trouble is near; for there is none to help. Many bulls have compassed me: strong bulls of Bashan have beset me round. They gaped upon me with their mouths, as a ravening and a roaring lion. I am poured out like water, and all my bones are out of joint: my heart is like wax; it is melted in the midst of my bowels. My strength is dried up like a potsherd; and my tongue cleaveth to my jaws; and thou hast brought me into the dust of death. For dogs have compassed me: the assembly of the wicked have inclosed me: they pierced my hands and my feet. Are you acquainted with Jesus? Have you been scornfully rejected? Have you been treated with disgust, discarded as worthless? Have you been spit on? Have you been hit by the palm of their hands? Jesus was acquainted with grief! What are you acquainted with? Who are you acquainted with? Grief is a deep sadness that was caused by bereavement, sorrow, hurt or pain. Sorrow is mental suffering, anguish, a cause or expression of sadness or grief. Isaiah 53:5, But he was wounded for our transgressions, he was bruised for our iniquities: the chastisement of our peace was upon him; and with his stripes we are healed. Have you embraced the suffering of Christ? Expect To See A Miracle, Know That You Are A Miracle!